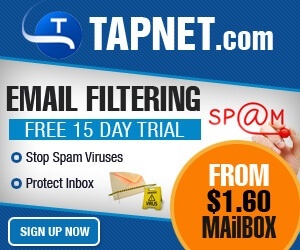 TAPNET Email Security Affiliates Earn 25% Recurring Commissions TANET Affiliate Program Commissions are paid monthly via Money Gram. Promoting the various products and services using the following banners can earn affiliates some great residual income. 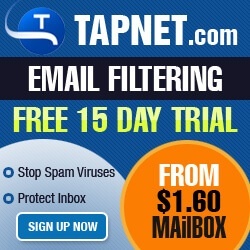 Sign Up today and begin placing banners and text links on your web pages and blogs to refer traffic. 4.Copy the code below in the banner you want to use and replace “001” with code with your number. 5.Place Banners on Websites and Blog Pages as well as any other places where you can post links like Facebook and Twitter.